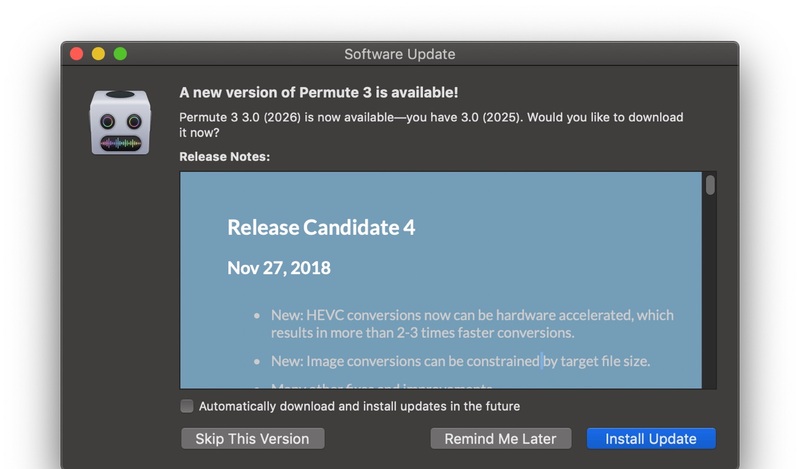 Mac用メディアコンバーター「Permute」が次期バージョン3.0でApple T2を利用したH.265/HEVCエンコードのH/Wアクセレーションをサポート。 | AAPL Ch. Hi, future version of Permute 3 will have (most likely sometime next week) support for HW acceleration of HEVC. This is done via VideoToolbox HW acceleration framework supplied by macOS, which should use the T2 chip. New: HEVC conversions now can be hardware accelerated, which results in more than 2-3 times faster conversions. New: Image conversions can be constrained by target file size.